Pasco County Sheriff Chris Nocco speaks about the day he announced Roy Halladay’s death. NEW PORT RICHEY, Fla. — It has been nearly four months since Chris Nocco told the world that Roy Halladay was dead, and one of his clearest memories of that day is a moment that no one else saw. On the late afternoon of Nov. 7, minutes before he held a news conference to confirm that Halladay's ICON A5 plane had crashed into the Gulf of Mexico, Nocco, the Pasco County (Fla.) sheriff, called his parents' home in Northeast Philadelphia. Nocco often made such phone calls to his wife, Bridget, whenever, he said, "things got rough." A grisly quadruple murder and kidnapping in August 2014. A fatal shooting inside a movie theater last March. I'm not going to be home on time, he'd tell her. Say a prayer. This time, he called his father, James, and his mother, Linda. They were Phillies fans, too, just as he was. They still lived in the same Brookhaven neighborhood where Chris had grown up. James is a retired Philadelphia police detective. Linda has taught CCD at St. Katherine of Siena, on Frankford Avenue, for 28 years. They had watched Halladay over his four seasons with the Phillies, watched him win a Cy Young Award and pitch a perfect game and a playoff no-hitter. They knew that Chris, 42, had known Halladay, 40, and had come to call him a friend. They got on the phone line together. "Hey, Dad, say a prayer," Chris said. "You're going to see this on the news. It's Roy's plane that crashed." "Oh, my God," his father said. "That poor man," Linda said. "That poor young man …"
Chris Nocco hung up. A few minutes later, six officers stood ramrod straight in an arc behind him. In front of him, a cluster of microphones tilted upward toward his face. He held a notebook in his right hand, glanced down at it, and began to say the thing that everyone feared he would say. Roy Halladay owned an ICON A5 light sport airplane. If there was anyone in the Pasco County Sheriff's Office who could appreciate what Roy Halladay and Philadelphia's brief encounter with his greatness had meant to the city, its baseball team, and its baseball fans, the sheriff himself could. Chris Nocco is 6-foot-4 and solid, with a short shock of black hair, and when he speaks, it doesn't take long to recognize where he is from; all his thats and theres are dats and dares. His boyhood home was a rowhouse near the intersection of Frankford and Morrell, and he loved the Phillies of the mid-1980s – Mike Schmidt, Juan Samuel, Milt Thompson. His father did not push him into law enforcement. He didn't have to. The Noccos and their neighbors shared the same experiences, the same social capital. They were the families of cops and firefighters, of roofers and carpenters. The same men who coached Chris' football and baseball teams wore uniforms and drove squad cars, and to him, those emblems signified men who were worthy of respect, who had authority, who were making their community better. After graduating from Archbishop Ryan, Nocco attended the University of Delaware on a football scholarship, playing left tackle for coach Tubby Raymond's Blue Hens, becoming an academic all-America candidate. He was under no illusions about extending his football career beyond college. The pull of police work was too strong, anyway. His first job in law enforcement was as an officer at Shallcross Academy, a since-closed reform school on Woodhaven Road for students so troublesome and undisciplined that they had been removed from their traditional public schools. From there, he moved on to Fairfax County, Va., where he met Bridget, then to Broward County, Fla., closer to where she was from. There, he worked as a deputy chief of staff to Marco Rubio, then the speaker of the Florida House of Representatives, and met Bob White, who was Broward County's sheriff. 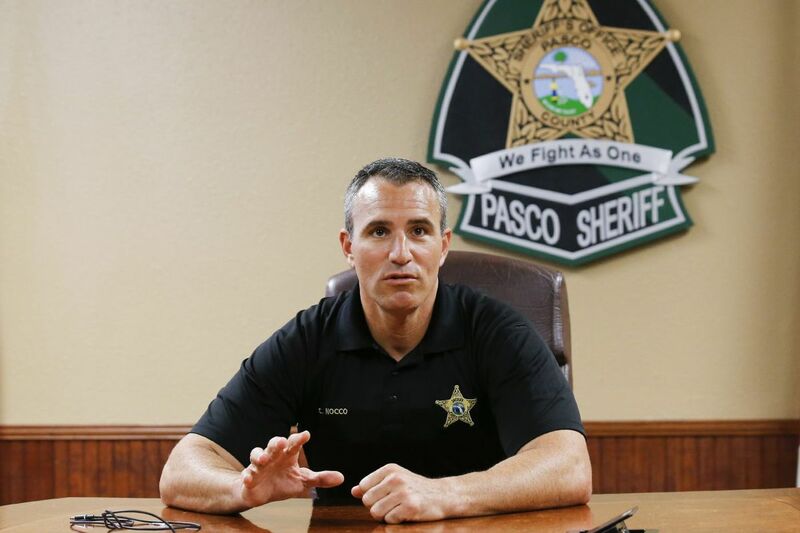 When White became Pasco County's sheriff, Nocco followed him to the Gulf Coast region. In 2011, he succeeded him. "I thank God I had the law-enforcement background to go into," Nocco said Tuesday in a conference room at his office, "because a lot of times in politics, you deal with B.S." Capt. Bill Davis (left) sits quietly as Chris Nocco speaks about the day he announced the death of Roy Halladay. In a way, it was what he liked most about Halladay, who lived in nearby Odessa. There was no B.S. to him, no pretention. Halladay had grown close with Capt. Bill Davis, the commander of Pasco County's juvenile investigative division, and through his friendship with Davis, he had gotten to know Nocco and several other officers. He accompanied them on a couple of ride-alongs. He and his wife, Brandy, purchased a dog — named Doc, Halladay's nickname — for the office's K9 unit and donated baseball memorabilia to a silent auction to raise money for two officers with cancer; the items sold for $20,000. On the Friday before his death, he joined the officers at a fishing tournament: T-shirt, shorts, flip-flops, a cooler full of beer and food in his hand, running late because he'd had to drop off his kids somewhere. "It was like God blessed the average Joe with unbelievable talent, inhuman talent," Nocco said. "The humility never left him." On Nov. 7, Nocco was attending a meeting with local religious leaders – two days earlier, 26 people had been killed at a church near San Antonio – when his chief deputy pulled him aside to tell him that there had been a plane crash. "We think it's Roy," the deputy told him. "I'm like, 'Roy who?' " Nocco said. "I didn't put two and two together." By the time he arrived at the scene, the body of a man who was at least 6-foot-6 had been recovered. Halladay was 6-foot-6. Nocco didn't have to look to know who it was. Already, details and rumors were leaking out. TMZ had obtained video of the crash and posted it online. Brandy, sobbing, had called Davis. Nocco, himself a father of three, sent officers and victim advocates to find Halladay's sons, Braden and Ryan, before any reporters did. "The tidal wave was coming," he said. Finally, it was time. He began with the notes on his pad, the cold details of the crash: the plane's make, its tail number, single-engine, two-passenger, the National Transportation Safety Board would handle the investigation, his office would assist. That took 52 seconds. He lowered the notepad. The story that's told the first time, he thought, is the story that lives forever. What he said next took 59 seconds. I can tell you, sadly, it has turned into a recovery. … There was only one body involved, and it's sad to say it's a friend of ours. It's Roy Halladay. Many know Roy as a Cy Young winner, a future Hall of Famer, one of the best pitchers ever to pitch in the game of baseball. We know Roy as a person, as a caring husband … and he loved his two boys tremendously. I can tell you, when he spoke of his family, he spoke with pride. I can tell you, Brandy and the boys and the entire family: We are so sad for your loss. Chris Nocco announcing on Nov. 7 that Roy Halladay had died. Neither Nocco nor Davis would comment on either the NTSB's crash report, which detailed Halladay's erratic flight path, or Halladay's autopsy, which revealed that he had amphetamine, morphine, and an insomnia drug in his system at the time of his death. The officers are protective of Halladay's image, of his family. They are loyal to a man who was loyal to them. "The legacy of Roy, who we know Roy to be, is never going to be tarnished, no matter what," Nocco said. "He was an unbelievable man. In society today, if somebody can do something to tear down anyone, even God himself, they'll do it. In our eyes, Roy can't be torn down." A week after the crash, the Phillies held a memorial service for Halladay at Spectrum Field in Clearwater. There, Nocco met Halladay's father, Roy Jr., and when Nocco shook his hand, Roy Jr. asked him a question. "I know where my son came into this world," he said. "Can you show me where he left?" Just a 40-minute drive from Spectrum Field, just a 15-minute drive from the Pasco County Sheriff's Office, there's a winding dock behind a waterfront restaurant. The Pithlachascotee River flows under that dock, continuing its northwest turn through this town and running on into the gulf, toward the horizon. From that dock, there is an unobstructed view of the place where Chris Nocco accompanied a grieving father the day after the service – of the spot on a vast sheet of shimmering indigo where, in that halting and terrible descent, Roy Halladay's plane fell from the sky. At 2 p.m. Tuesday, a motorboat trundled in that direction, leaving a wake of scattered white foam. A cloud, tinged with gray and shaped like a large turtle, hung low against sunlit blue. The conversations of the patrons on the restaurant's outdoor deck were whispers. It was so quiet and so beautiful and, because of what had happened there, so heartbreaking that it would have been appropriate to say a prayer. The dock over the Pithlachascotee River, near where Roy Halladay’s plane crashed.